Cardiff has a great history which dates back 6000 years and there is so much on offer no matter what your interests are. Our city is a vibrant and ever growing city. The Welsh are notorious for being so friendly and welcoming to any visitors and Cardiff is a popular city for families and students. There is so much to do within our city. In less than 30 minutes you can travel to beautiful beaches, to Cardiff Castle and more. Getting outdoors with your little one is so important. But often the cold weather can put you off. I have rounded up my favourite places so I hope you can try and visit some of these places when we get the odd bit of sunshine. Garwnant Visitor Centre has become my number one spot. It is a beautiful forest that caters for youngsters like Nancy and older children alike. The walk we do only takes about 30 - 45 minutes and is mostly flat. There is a also a perfect outdoors play area for under fives and a more adventurous section for older children. There are benches to enjoy a family picnic or a little cafe. 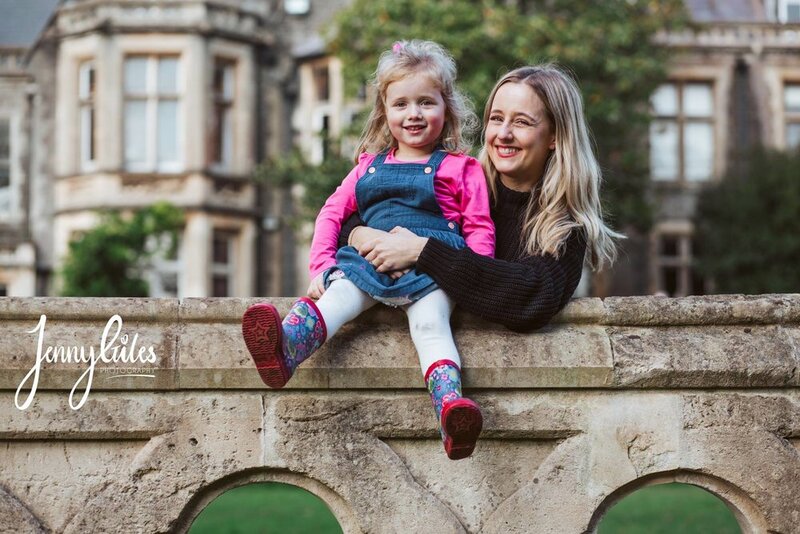 Insole Court is a wonderful family day out. The house has recently been restored and is such a beautiful place. There is also beautiful gardens that your little can explore. The perfectt place to play hide and seek. When you are tired out from running you can pop to The Potting Shed for a delightful hot chocolate. The cafe boasts a variety of food including a selection of vegan goodies. There is also a lovely selection of toys for little ones to occupy themselves with as you drink a latte. Bute Park is a fantastic place to take a family no matter what the age. We regularly go here on weekends. You can either hire bikes and cycle around the beautiful grounds or you can simply take a stroll leisurely through the park. I would recommend a coffee stop at Pettigrew Tea Room and a picnic lunch at The Secret Garden Cafe. Sitting within the city centre you are able to fit this nature walk alongside shopping or even a trip to Cardiff Castle. Ogmore-by-sea is a beautiful beach just outside of Cardiff. There is a green area where we often enjoy our picnic before heading to the beach to building sandcastles and paddle our feet in the water. It is also a popular destination for keen fishermen. St Fagans National History Museum is probably one of my favourite places. Though as a historian I may be completely biased. It is the place every primary school child in South Wales has visited at least half a dozen times before they graduate. It is however a great example of British history and how it has changed over time. Upon entrance you will be blown away by the beautiful new reception area. As you come out there is a fantastic play area for children and a lovely coffee shop and cafe. As you walk through the grounds you will often see sheep grazing. You will then be dazzled with a the old village, with an authentic shop, a school, a working bakery, a cobble workmen and a beautiful afternoon tea cafe. You then go on to the grand house which is full of beautiful furniture. The lake at St Fagans is something out of a Jane Austen novel. You will honestly be spoilt for choice. If you enjoy a good pub lunch then I recommend a stop at the Plymouth Arms, just outside of St Fagans. They do a hearty pie or a glorious Roast Dinner. Roath Park is a popular weekend trip for families. I remember the slide at Roath Park with fond memories. It’s probably one of the biggest slides I have ever seen and if you want to see a lighthouse in the middle of a capital city then this is the place for you. There are also beautiful gardens full of vibrant flowers and ample space to sit and watch the world go by. Mountain View Ranch, Gruffalo Parkis a beautiful family day. If you research before the day you will be able to attend their story book session. Little Red Riding hood will take you on an adventure to find all the Fox, the snake, the owl and the Gruffalo! There is also a fairy garden, a fabulous play area and lots of other activities to keep you busy. Amelia Trust Farm is a farm run by a charity group. Relying on donations during weekdays and charging a small fee for weekend visits this is a wonderful farm for children. There is a fairy walk through the woods for children, which brings imagination to life and a farm full of animals to delight any child’s heart. You are also able to pet some of the animals and even embark on a pony ride! When we visit the farm we usually pack a picnic and make a day of it. We first visit the animals, Nancy loves looking for the bats, we then walk through the forest before a coffee pit stop and sit on the grass for a picnic.there is also a wonderful play area and my daughters favourite part; a tractor!